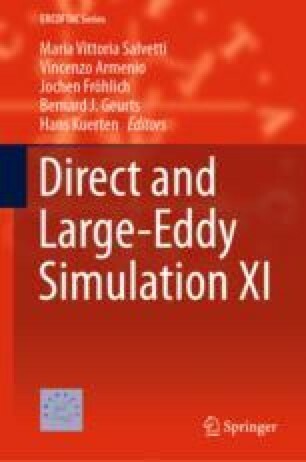 A transient piloted turbulent non-premixed methane jet flame approaching its blow-off limit is numerically studied by high-resolution Large-Eddy Simulations (LES). In the statistically steady jet phase, the high turbulence intensity leads to local flame extinction and re-ignition events. During the transient phase, the pulsation leads to a global flame extinction soon after the blow-off velocity is reached. The flame then re-ignites when the strain is relaxed. To model turbulent combustion with a minimum set of equations in order to reduce the computational effort, a tabulated detailed chemistry approach is tested. The authors gratefully acknowledge the financial support by the state North Rhine-Westphalia, Germany. We thank the University of Duisburg-Essen and the Center for Computational Sciences and Simulation (CCSS) for providing time on the HPC system magnitUDE (DFG grant INST 20876/209-1 FUGG) at the Zentrum für Informations- und Mediendienste (ZIM).